I adore the mosaic modeled after a 1934 work by Ferdinand Fargeot. 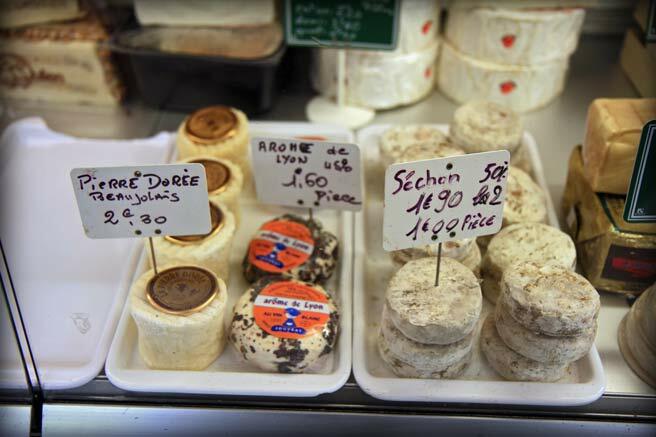 If there's one place that's easy to get to in the 3rd arrondissement, it's Place Guichard. The market is right above the metro stop on line B. The tram T1 stops there, and two buses stop within close proximity. The two-lane dedicated bike path that cuts east west across the city runs right next to the market, and there's a VeloV station just next door. If you are a budget traveler, in fact, this neighborhood being super accessible by public transport, is a smart choice for a pied-à-terre if you can't afford the choice digs on the presqu'ile. 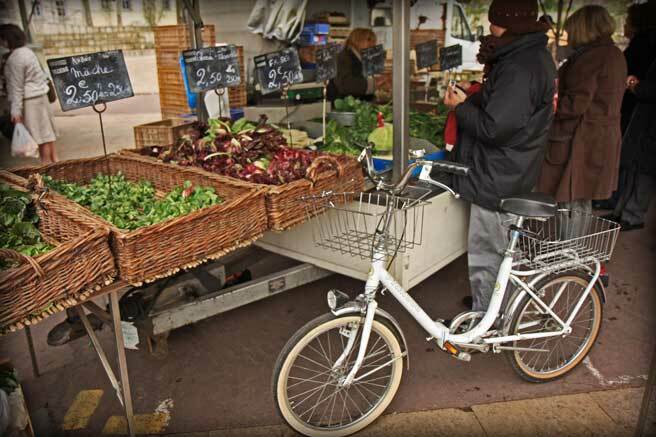 This market is an easy excursion by bike from centre ville. 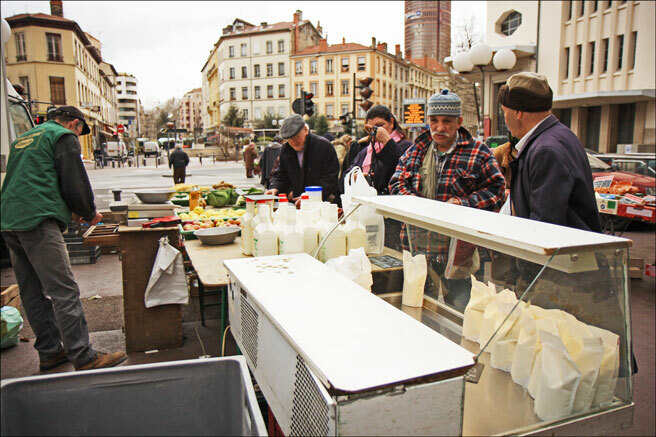 If you plan to visit Les Halles, Place Guichard would be nice start to a discovery tour of the neighborhood. 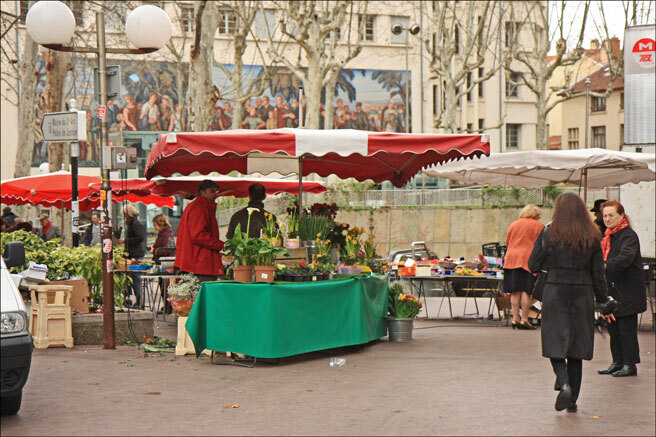 The square is at one and of a pedestrian walkway lined with outdoor cafés, with Les Halles at the other. 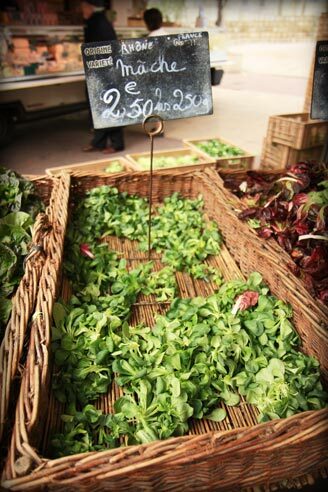 It's a nice place for inexpensive local produce, and Les Halles of course is the place to get just about everything else you can think of. are succulent draws to Marché Guichard. 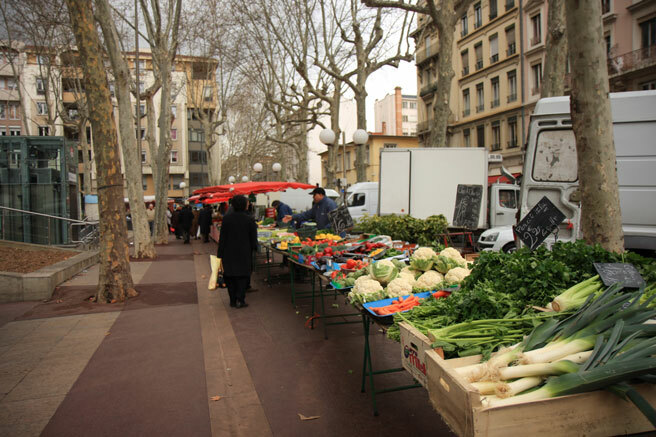 The market at Place Guichard on Tuesdays and Saturdays is small, with only 8 official vendors, but features some quality local produce that is clearly popular with the neighborhood peeps. So popular in fact, that you have to take a number! There's a raw milk vendor that also has pasteurized and fermented milk products, 2 fromagères, four vegetable stands, and an organic bread baker bringing in his loaves from Gringny. The vendors here know their clients, call to them by name, share their news, but don't hesitate to also talk to strangers. There is a lot of good natured fun and smiles at this market, they don't get big crowds and nobody's in a hurry. The hustle and bustle and circus atmosphere we sometimes see at the larger markets is left aside here, no hollering sellers, no pushy salespeople, just honest selling going on here, where people take the time to talk. In addition to the produce, cheese, and bread, there is a florist and stands selling prefab goods like knives, cooking pots, and electronic items, which can vary, depending on the day. There are no ready to eat meals, but if the weather is nice, you can easily have a cold picnic with purchases from this market and enjoy them in the amphitheater on site. i always love your photos lucy! everything looks great... especially the bread! Thank you Lucy,I am so there . And shortly after the vendors have left, I love the wonderful scene of melancoly and that earthy leftover smell. I've visited your blog a number of times and just wanted to say how beautiful the pictures are. I've always had a dream of going to France! Now, at least, I can enjoy it vicariously through your blog! Really spectacular! And wouldn't you know, my favorite outdoor pastime is going to Farmer's Markets. I am really enjoying this post. Quite beautiful and informative. Although, I am a bit envious. It's nice to see Lyon in the eyes of another's eye. I liked these photos in particular as they show the people, a more pulled back look ya know? I love the closeups as well but you could almost start imagining a false idea of what the area looks like and it's neat to see real photos. It looks kind of cold, and I see a lot of black coats. haha sorry, just my first thoughts that popped in to my head. I also love how the food is displayed in big baskets, it's so lovely. Thanks for sharing!! 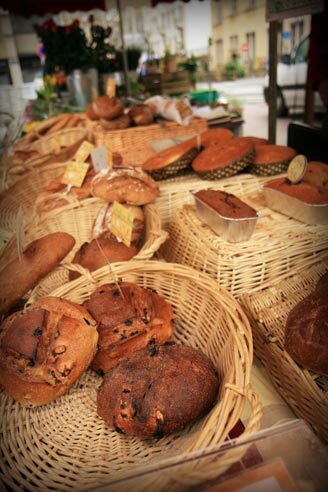 Do you ever snack on cheese and bread from the market whilst out and about? Or do you always wait untill you get home? Thanks for your comments and feeback. I really appreciate it! Tace, I don't usually eat while out unless it's sitting down in a cafe or at home. 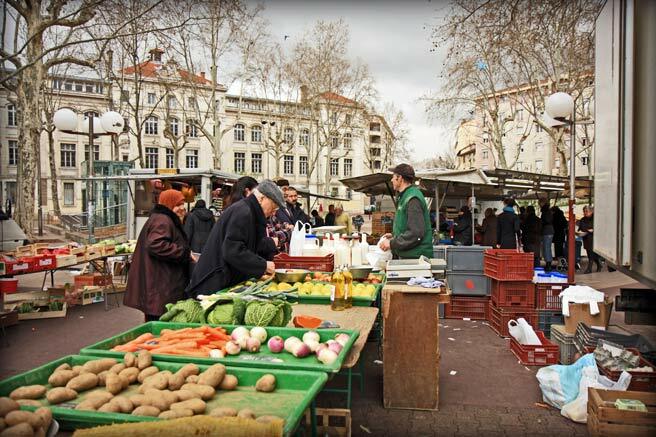 But that's not to say it wouldn't be easy to make a quick picnic at any one of these markets. Lucy -- thanks for your beautiful photos, as always. They're my consolation for having no travel budget (or vacation time) this year. I'm more than a bit envious of E0.90 a litre for raw milk? I just saw a quart for US$4.25 at our local shop... and that's when it's even available. The limited supply and increasing demand usually mean there's a stampede for it and an empty slot on the shelf. The Bourse du Travail is also such an undervalued concert space - even though they have a lot of "mainstream" buggy stuff, I also saw an incredible Steve Reich concert there last year. As far as prices go, yes, it's cheaper, but not as cheap as you'd think! When I was looking for apartments last year I was surprised at how much the rent was in this area. We're in the 3e, but on the Saxe side, and our place is well, not cheap. But it is new, which does play into it. Your pictures are absolutely fabulous. They practically jump off the screen. 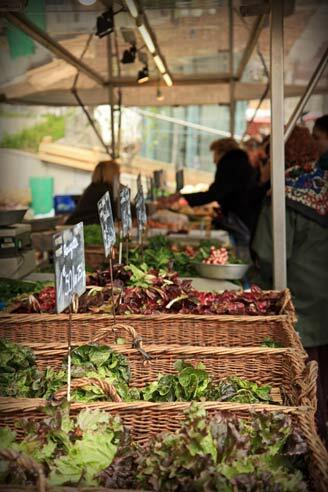 And there is hardly anything better than an open air market. Thank you Marija, I think I am going to have to put that on my ever growing list of things to do! Anita, that price for milk is simply unheard of. I cannot believe it! Have you tasted it and is it worth the price? Gina Louise, I am a huge Steve Reich fan and got a chance to talk to him when he came through Lyon a few years ago. I wish I could have seen his work performed at the Bourse de Travaille. It must have been amazing. Thank you Molly, for coming by! 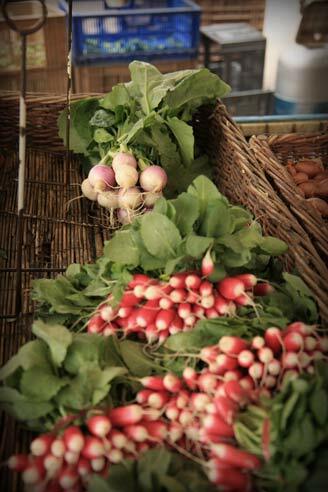 I love your pictures!\You're lucky to have such a cute farmers market nearby. I know this was a couple weeks ago but you have green stuff!!!! Here in NYC we still have root vegetables and apples. Though I think there was a stand at USGM that had cabbage this weekend. Your knowledge of the local markets seems encylopedic, so I thought I'd ask if you know where I can get good local organic milk -- you know, the creamy stuff that has a hint of grass and herbs like I've sometimes had in little Swiss villages, preferably whole and raw. I bought a liter of Bernard Gaborit at one of the local bio supermarkets and it was impressive -- non-homogenized, so it needed a good shake, but creamy and very tasty. But I was disappointed to find out that it travels a relatively long way, from near Nantes. There must be a local producer and vendor for something similar... the Alps are so close. 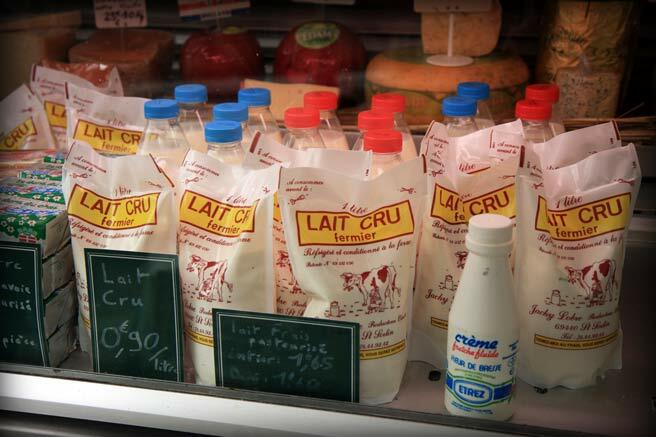 The lait cru I've found at Quai St-Antoine and the organic market next to St Jean are good (and cheap! ), but "thin" compared to Gaborit's. Please share if you know of a good source! 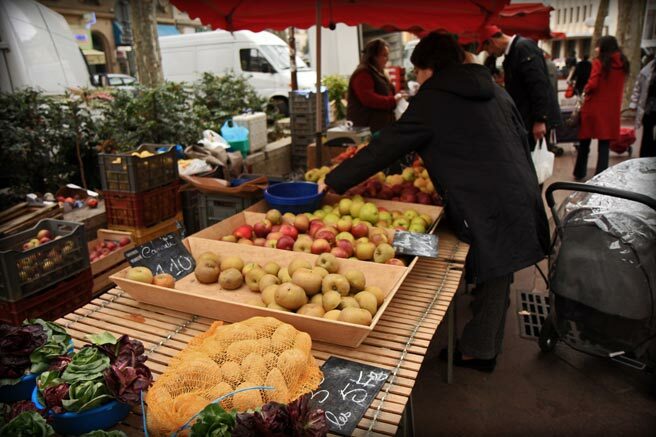 I will certainly let you know - you might try the producers market on Place Carnot Wednesday evenings starting at 4pm. There are several raw milk selling producers selling there, maybe one will hit the right note with you.